Sayer and Bennett - From Monmouth to Llanbeder. An antique road map from "Jefferys's Itinerary; or Traveller's Companion, Through England and Wales......." From Llandeilo Crusseny to Abergavenny, Crecowell, Brecknock, Redbrue, Llandimdofry, Pinsant to Llanbeder. Published by R. Sayer and J. Bennett in 1775 with later hand colouring. 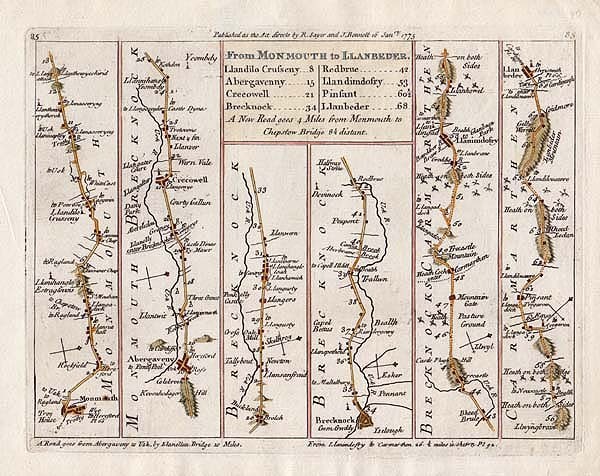 An antique road map from "Jefferys'sItinerary; or Traveller's Companion, Through England and Wales......." of the road from Monmouth to Llanbeder via Llandilo Crusseny, Abergavenny, Crecowell, Brecknock, Redbrue, Llandimdofry and Pinsant. Published by R. Sayer and J. Bennett on 16th June, 1775 with later hand colouring. 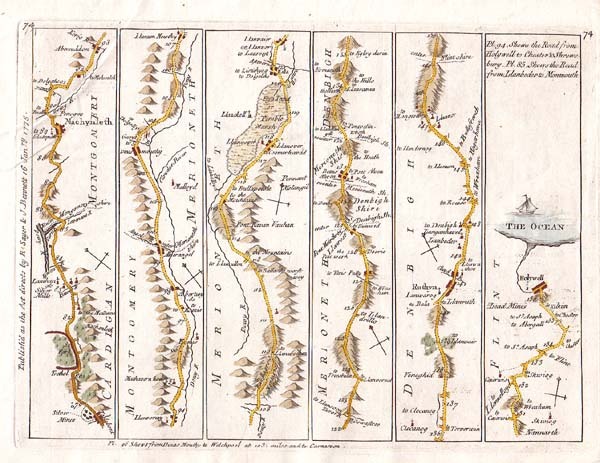 Thomas Kitchin - The Continuation of the Road from London to Barwick, Begining at Tuxford & Extendg. to York. More Info An antique strip road map showing part of the road from London to Barwick and includes the route from Tuxford, to Doncaster, Wentbridge, Tadcaster and on to York, including Sherwood Forrest. This is sheet three of a five sheet series. Published by the London Magazine, c. 1767 with later hand colouring. 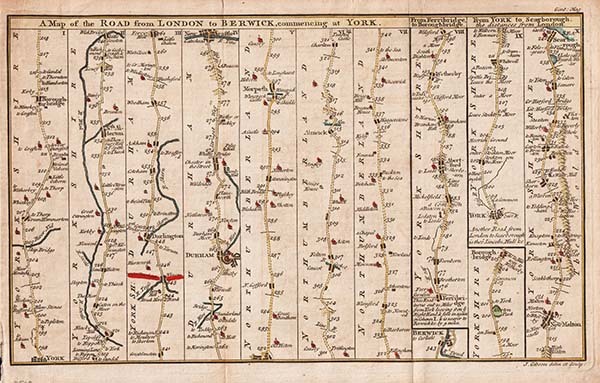 An antique strip road map showing part of the road from London to Barwick and includes the route from Tuxford, to Doncaster, Wentbridge, Tadcaster and on to York, including Sherwood Forrest. This is sheet three of a five sheet series. Published by the London Magazine, c. 1767 with later hand colouring. 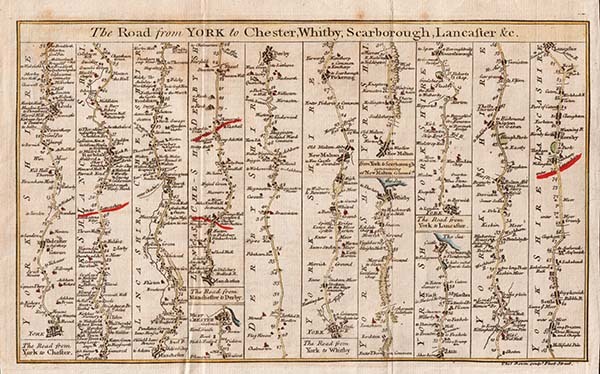 The Road from York to Chester, Whitby, Scarborough, Lancaster &c. - Thomas Bowen. An antique map which was engraved by Thomas Bowen and published in The Gentlemans Magazine in 1766 with later hand colouring. The frst route is from York to Chester, then from Manchester to Derby, then York to Whitby, the York to Scarborough commencing at New Malton and finally the road from York to Lancaster. 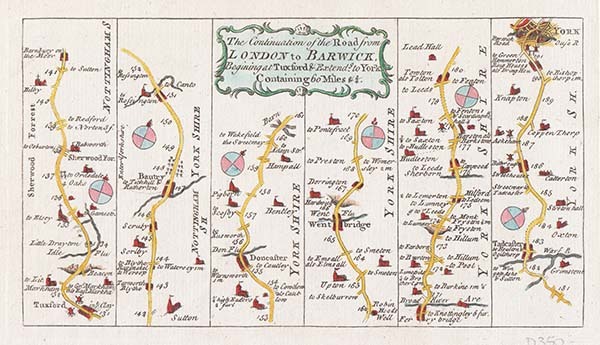 A Map of the Road from London to Berwick commencing at York. - John Gibson. An antique map which was drawn and engraved by John Gibson and published in the 'Gent. Magazine'. Circa 1775 with later hand colouring. Sayer and Bennett - From Prestain to Carmarthen. An antique road map from "Jefferys's Itinerary; or Traveller's Companion, Through England and Wales......." From Prestain to Carmarthen" and shows the route from New Radnor to Bealt to Ludlow Vaugh to Llanimdofry to Abermarlos to Rue Radnor to Abercothy to Carmarthen. Published by R. Sayer and J. Bennett in 1775 with later hand colouring. 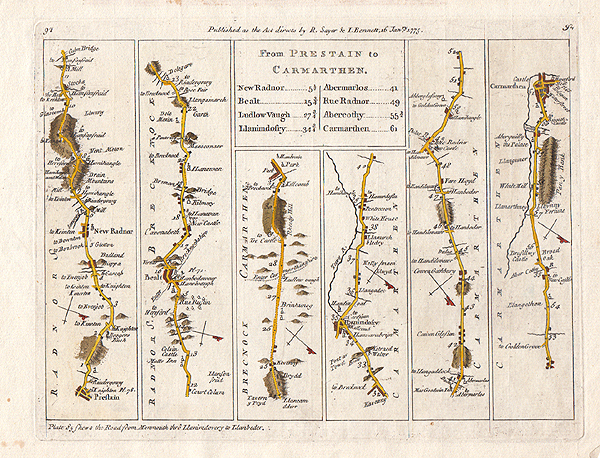 An antique road map from "Jefferys's Itinerary; or Traveller's Companion, Through England and Wales......." The Road from St. Davids to Holywell" and is Plate 74 It was published in 1775 with later hand colouring. This map includes the section from Talybont to Dinas Mouthy to Bala to Ruthyn to Holywell.